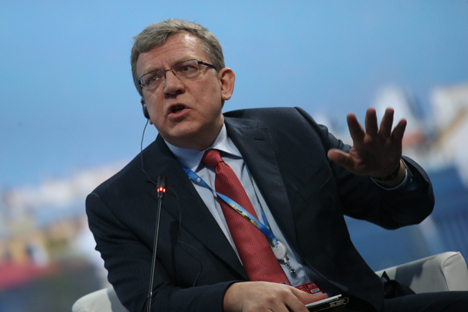 Alexei Kudrin taking part in a panel session titled "Economics: Frank Answers to Pressing Questions" at the St. Petersburg International Economic Forum. Russia is in a full-fledged crisis, former finance minister Alexei Kudrin said during a business breakfast organized by Sberbank during the St. Petersburg International Economic Forum. Russia is in a full-fledged crisis, former finance minister Alexei Kudrin said during a business breakfast organized by Sberbank during the St. Petersburg International Economic Forum, on June 19, 2015. "There'll be decline in the second and third quarters, a little less in the fourth. Russia is in a full-fledged crisis," he said. Kudrin said there were "several unpleasant features" about the crisis, including the substantial devaluation. Real wages have gone down 10 percent, and real incomes more than 4 percent, "and the drop will be greater in the year as a whole," he said. Several enterprises have sent their employees on leave or they are not working full shifts, and have scrapped numerous employee benefits in the belief that they can survive the summer, and that things will be easier in the fall, said Kudrin. "But it won't be any easier in the fall," he said, adding that enterprises will have to lay off staff then.